On a pier-and-beam foundation (as opposed to slab), plywood is laid over the floor joists to provide a subflooring on which to install carpet and tile (although tile requires cement board over the plywood). As in other parts of construction, we had requested all screws be used. I don't know if they were or not, but I do know that in some places, the floor squeaks, primarily under the carpet. (The cement board over plywood, as well as the tile itself, probably helps prevent squeaks.) When we get new carpet, we will take care of those squeaks. At Judy's house, the builder, Buss Construction, not only screwed down the plywood, but glued it as well. So Judy should have no squeaks (knock on plywood). We hope to stay in this house for a long, long time. We had good carpeting in our last house, but it started showing wear in heavy usage areas, such as in front of the sofa in far less than the 10 years we lived there. We don't want to have to change carpet (or put up with worn, dingy carpeting) every 6 or 8 years, so we chose tile for all the rooms but the bedrooms and the master bath/closet and the loft. Not only should the tile last indefinitely, it should look better. We also had some wood flooring in our last house, but we are going for a more contemporary look in this house, and we thought that was easier with tile. Also, the wood floors we previously had began to show scratches on them after a few years, and we really were not home that much to scratch. Something we didn't know until we picked our tile is that most of the tiles you will see for interior floors will be ceramic, which has a baked-on finish. Ceramic tile is very hard, but if a tile did get chipped somehow, you would see the ceramic material underneath, since the surface finish does not go all the way through the tile. The tile we liked is porcelain. What you see on the surface of a porcelain tile goes all the way through it. We did not even realize this when we picked the tile, but one thing we liked about the tile is that it had more texture and depth to it than the other tiles we looked at. It turns out that this is only possible because of the color going all the way through the tile. Another benefit is that if the tile gets chipped, it wouldn't be noticeable. We were told that the porcelain tile is just as strong as ceramic tile. Carpet is normally installed over a pad which is laid on top of the subflooring. 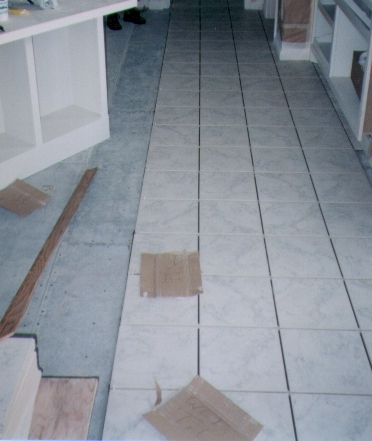 For tile, concrete board is put down over the subflooring and mortar is used to attach the tiles to the cement board. Some sources say that with a crawl space below, a vapor barrier (4-mil polyethylene) should be put under the pad to keep it from deteriorating. Builders will probably tell you that this is not necessary or they have never heard of such a thing, but we did not get a vapor barrier and our padding has fallen apart after 8 years. We asked the installer if the tile would need sealing and he said no, but that grout needs sealing if you are worried about its getting stained or dirty. Since we are using medium gray grout, we don't think stains would show and we are not going to seal the grout. However, the installer had made pencil marks on some tiles and the marks would not come out, even with cleanser. They are supposed to replace the tiles, but have not done so yet. If some marks cannot be removed, it would seem to us that the tiles DO need sealing. Another problem is that the installer did not get all the tiles level, so all four legs of chairs do not sit squarely on the floor, causing them to wobble. We doubt that anything can be done about this without ripping out all the tiles, which isn't going to happen. The solution is to deal with a company with a good reputation so these problems don't happen. The installer will probably have some tiles left over when he is done. You may want to talk to him before he orders to make sure that he does order some extras for you to keep for repairs. We had a problem at a house we used to own which caused several tiles to crack. We did not have any spares and had no way of getting any matching tiles, so we had to leave the cracked tiles where they were. There are two ways to finish off the space where the tile butts up against the walls and cabinets. One is to have the tile come close enough so that when a quarter-round molding is put down along the bottom of the baseboard, it will hide any gaps between the wall and the edges of the tile. We did not like the look of the quarter-round molding, especially along the bottoms of the contemporary styled cabinets. Fortunately, Craft agreed and had the tiler take extra care to get the tiles tight up against the walls and cabinets so that no molding was necessary. Here's a 2-year follow-up report: quite a few tiles have cracked in various places in the house. We assume that this was caused by shifting of the foundation, but we don't know that for sure, nor do we know what, if anything, could be done to prevent it. A problem we had with the carpeting is that the master bedroom is too big to be covered by the width of a single roll of carpeting. In other words, two rolls had to be used side-by-side. This is not unusual, but what was unusual in this case is that Floors Unlimited was unable to make the seam between the two unnoticeable. We had them out a couple of times to try to fix it, but about all they did was shave down the pile along the seam a little. To this date, the seam is still very noticeable. Floors Unlimited claimed that this problem is normal and unavoidable. Well, we didn't have this problem with our last house, which had an even larger master bedroom. We have also heard it said on TV home shows, such as This Old House, that good carpet layers can make seams which don't show, so you might want to discuss this problem with flooring companies before choosing one.